Arrange rack in middle of oven; preheat to 400°F. Mix garlic, cumin, oil, paprika, pepper, oregano, 1/2 tsp. salt, and finely grated zest from 1 lemon in a medium bowl. Quarter zested lemon; set aside 2 quarters. Squeeze juice from 1 whole lemon and remaining 2 quarters to yield 2 Tbsp. juice; stir into spice mixture. Place chicken breast side down on work surface. Spatchcock chicken by cutting along both sides of backbone with kitchen shears. Remove backbone; reserve for stock. Turn chicken breast side up and splay open. Press down on breastbone with palms until you hear it crack and chicken is as flat as possible. Pat chicken dry with paper towels. Rub chicken all over with 2 reserved lemon quarters. Squeeze juice over bird, then rub skin all over with inside of rinds. From both edges of cavity, loosen skin from breasts and thighs, being careful not to tear skin. Using your fingers, gently spread 2 heaping Tbsp. spice mixture under skin (reserve remaining spice mixture), then season chicken all over with remaining 1 tsp. salt. Transfer chicken, spread flat and skin side up, to a roasting pan or large skillet. 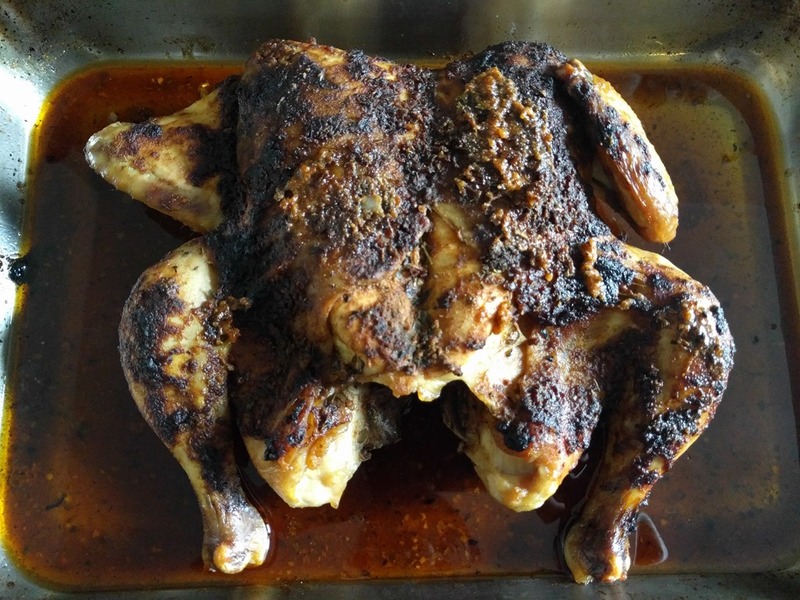 Roast chicken 20 minutes, then brush with spice mixture and pan juices. Continue roasting, basting with spice mixture and pan juices every 20 minutes, until juices run clear when thigh is pierced with a fork or an instant-read thermometer inserted into thickest part of thigh registers 165ºF, 50-60 minutes total. Transfer chicken to a cutting board and let rest 15 minutes.